Your happiness and health are your top priority in life. These qualities are central to everything, and fortunately you can benefit either one by improving the other. Happiness will definitely make you healthier. The research is building daily showing how your mind and emotions affect your health. I hope to inspire you to positive action here, by pointing out how the practice of Goodfinding...creating happiness on purpose...will improve your brain health, heart health, immune function and healing capacity. By the way, the studies cited here are just the tip of the iceberg as far as research in this area goes. You will find more studies cited all through this web site, referencing ways in which your positive mental focus can improve your physical, mental and emotional health. 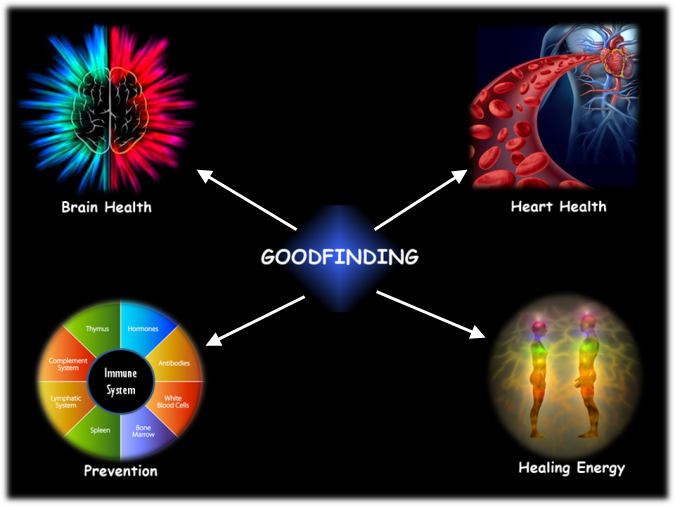 How Does Goodfinding Help With Happiness And Health? The answer to that question is, "more ways than we can count here." But we'll cover some of the most important ones for you. Brain health -- Since the default, problem-focused part of your brain runs on automatic, it uses very little of your brain capacity. To focus on what is good, right and working, and develop an attitude of gratitude, appreciation and optimism, you have to use more of your brain capacity, which is good for brain health. Author David Snowdon's book Aging With Grace reports findings that brain activity and optimism may help to prevent Alzheimer's Disease and contribute to longevity. Heart health -- Your heart improves in rhythm and regularity when you are experiencing and expressing love and appreciation. The Institute of HeartMath has done extensive research for years, demonstrating how these positive emotions are beneficial to the human heart, just as negative emotions such as frustration impair its function. Practicing Goodfinding skills will help you to create a healthy habit of generating these heart-healthy positive emotions on an ongoing, everyday basis. Prevention -- In many ways, good health equates to a strong immune system. Just as research has clearly shown for many years that depression lowers immune function, evidence is now mounting that demonstrates that positive emotional states enhance immune function. Dr. Herbert Benson, in his excellent book Timeless Healing, reports that a strong sense of faith and optimism lead to fewer illnesses and faster recovery. Healing energy -- There is an energetic field that surrounds the human body. This is actually very down to earth and practical. It's just heat and light -- electromagnetic energy and thermal energy. You have seen the "healthy glow" from a person experiencing lots of happiness and health, and that's what we're talking about here. The happier and healthier you are, the stronger this energy becomes, and research is showing how it is beneficial to you and anyone in your atmosphere. Watch this excellent video where Lissa Rankin, M.D. talks about the placebo effect, spontaneous remission and the importance of close, nurturing relationships in the healing process. What Are The Steps To Improve My Happiness And Health? Goodfinding is a set of tools you can use with anything you want to improve. The three components, gratitude, appreciation and optimism can be applied to any subject, just as we will now apply them to your good health. Be grateful to and for your body, focusing on all of the self-healing it has done since the day you were born. Think of all of the illnesses and injuries you have recovered from, and thank your body for its return to health. Remember the times you were afraid you wouldn't get better...and you did get better. Say a big "Thank you!" to the magnificent self-healing, self-correcting physical organism that is your home and your vehicle in this life. Be sure to journal your thoughts on all three of these processes. That will "lock in" these thoughts and feelings, activating more emotion and physiology, adding greater impact on your physical health. Appreciate your body right now. Do a "head to toe" inventory, focusing on your organs, your senses, muscles, bones, ligaments and joints. Notice and appreciate what is working, especially what has always worked and never caused you problems. Then focus on those areas that have worked very hard to heal and recover from problems. Think of the value of each organ, sense and function, and how much you appreciate being able to see, hear, sense, taste and touch. Appreciate your ability to balance, walk, sit and stand. Take nothing for granted. Be optimistic about your body's ability to continue to rebuild, revitalize, renew, rejuvenate and re-energize. This is how you put the Placebo Effect to work for you. The more faith, hope and optimism you have about your body's ability to heal, the better it will work for you. The best wording for this is, "I look forward to feeling (good, better, great)," "I look forward to looking back and realizing that this problem is solved, and these symptoms are gone." 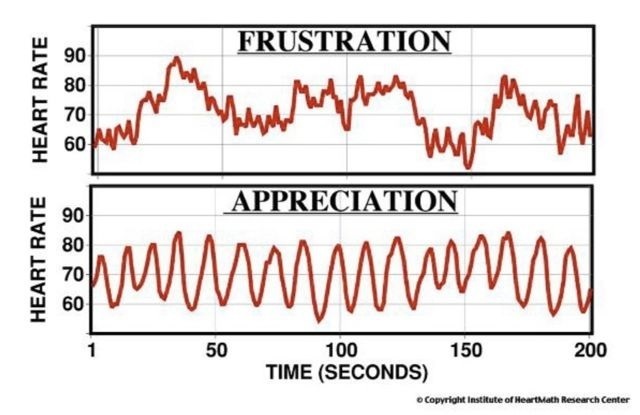 Take a look at the chart below to get an idea of how your heart responds to positive and negative emotion, according to the Institute of Heartmath Research. The more you repeat positive statements of love and appreciation to yourself, the stronger your emotional connection will be. And the stronger your emotions, the greater impact your Goodfinding process has on your happiness and health and your physiology in general. Soon, you will create a new default process regarding your happiness and health. Any time you want to feel better, emotionally, mentally or physically, practice these exercises until your feelings shift. To get a great overview of the many ways in which happiness is good for your health, check out this excellent infographic. Your happiness and health grow hand in hand. As your Goodfinding practice becomes stronger, you will find your total well being becoming more robust and resilient every day. Creativity Tools -- Creative expression is essential to your health and happiness, and can actually help to prevent many of the problems associated with aging. You are a natural born creator! Happiness Articles -- Discover why reading articles about happiness is so very important for your health, your attitude, your relationships and your success in life. Authentic Happiness -- Learn what it means to have deep and lasting joy, that reflects your values, your integrity, and benefits you in every way. Definition Of Happiness -- Find out what happiness really is, and how it is truly a matter of body, mind and soul. Also get tips on short term and long term happiness. Self Motivation Techniques -- Everybody wants to be just a little (or a lot) healthier and happier. Well, here are your step-by-step instructions on how to get exactly where you want to be. Laughter Is The Best Medicine -- Find out about all of the many benefits of a good chuckle, giggle or guffaw. Learn about how laughter helps your body, your mind and your social life.